I smiled when I saw the hot pink cover of this book, it was so eye catching! (Granted, I happen to love pink.) Add to that the fact that an Aussie author has written this with an Aussie heroine, and I was a willing reader. This is the second book by author, Kathryn Ledson, and while I haven’t had the opportunity to read her first book ‘Rough Diamond’, it wasn’t a problem for me at all. This book is a great stand-alone read; it’s light-hearted, engaging and escapist reading. The main character, Erica Jewel, is in the early stages of a relationship with Jack Jones, a very hunky undercover agent. When he and his partner fail to return from their current assignment, feisty Erica goes looking for them. Their trail leads to Darwin, and then to the island of St Sebastian, and that is where she ends up in some ‘monkey business’. In her own inimitable fashion, she eventually asks the right people the wrong questions. She manages to find Jack and his partner Joe, with the assistance of a scamming taxi-driver. And when she does find Jack and Joe, that isn’t the end of their troubles – oh no! It might sound a little over the top, but it all works. The narrative style pulls it together, and I enjoyed the feeling that Erica was telling the story to ME and no-one else. And, it’s just OTT enough that it held my attention, and slightly implausible bits really didn’t matter at all. If you are looking for a book to read on a trip somewhere, or for a book to read when you get there, or even a book to read when you get home, ‘Monkey Business’ would be a great choice. There is more than enough Australian flavor to it to overcome the inevitable Janet Evanovich/Stehpanie Plum comparisons, which aren’t valid anyway. A pretty cover; an Australian author with an Australian story; lots of characters good, bad and quirky; an international, black-market Tupperware syndicate; and lots of good descriptions as Erica gets herself in and out of trouble. She was my favorite character; very relatable; I could understand her moods and her need to find out the truth. Overall, I quite enjoyed the read, fast-paced, funny and a good dash of romance as well. I really think I need to go and look for her first book ‘Rough Diamond’ and read it, very soon. And possess my soul in patience while I wait for Kathryn to produce the third book in the series. 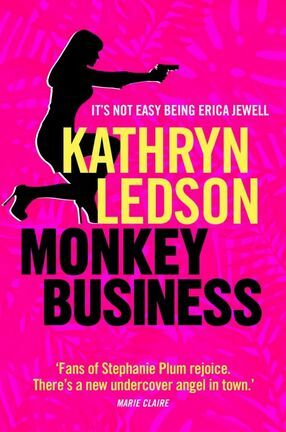 To purchase a copy of Monkey Business pop over to Booktopia!